Have you read the label of what's in your moisturizer lately? Or your nail polish? Even if it isn't in too tiny letters, what does it all mean? If you are like me, you are careful about the food you put in your body, but less aware of what's in the stuff that's going on your body. 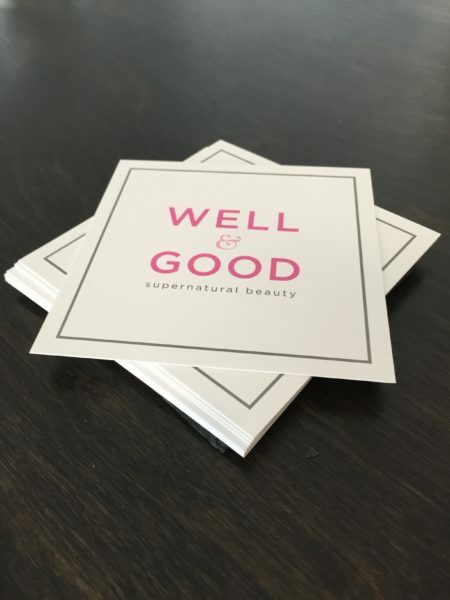 "I think we are all reading food labels, at least a little bit," said Kim Smith, proprietor of Well & Good Beauty, a store that's just opened on Waverly Place in Madison. "And you can look at a food label and kind of figure out what doesn't sound like food. But in beauty, you really can't do that." But Smith can. She has the experience form a 25-year career in the beauty industry, first on the editorial side at Glamour and Allure magazines, and later doing public relations for brands like Kiehls, Hard Candy and Bumble & Bumble. And she knows how to read a beauty label and make sure what's inside is the good stuff. "You look to see what sounds bad, and it kind of all sounds bad," said Smith. "Tocopherol is Vitamin E. Tocopherol sounds frightening. But actually it's really good. Parabens are really bad for you, but they don't sound that different. So what's a girl to do?" A girl can come to Well and Good Beauty. Or a guy - there are shaving supplies and deodorants too, plus who doesn't need an eye cream after a certain age? Smith will read your labels and help you understand what it means. Or you can just buy the things at her store. She has done the work for you, offering a smartly curated collection that lives up to the store's name. No chemical fragrances, chemical preservatives, phthalates or parabens. Smith has done the deep dive into research on what are the cleanest, best products -- many of which can't be found elsewhere in New Jersey -- and brought them practically to our door step. She's happy to discuss the specifics for the educated customer, or just recommend a gift for the new mother (Zoe Organics for mom and baby arrived last month) or the tween (Olio & Osso lip balm and cheek tint will feel like makeup to your daughter, but she'll still look 12, not 20). "Natural beauty, ten years ago, meant puting mayonaise on your face or washing your hair with baking soda," said Smith. "I definitely don't do that." Many natural products found at Well & Good Beauty are now sold at Barneys and on Net A porter, notes Smith. "So, wow, look how far it’s come!"